3D BIM modeling is becoming more popular and popular in several years. Almost engineers, architects, project managers, contractors and other building services have accept it universally. Therefore they invest money and time on learning and piloting system. However, we can see a lack of clarity among the clients, they all know the benefits of BIM but don't know when and how to start and maintain to get the highest effecient. Most of the owners are still confused about the exact achievements of these models when compare with the investment cost. They are also not much aware on how to get optimum use of this concept. Firstly, before apply BIM to project, we have to know the difference between a parametric BIM models and non-BIM 3D CAD Models. 3D CAD Models are only virtual representations of a facility and it provides only visual details. 3D CAD Models that are created using applications such as AutoCAD architecture and AutoCAD MEP are useful for design, development, pre-fabrication and construction. But, BIM models are intelligent models, which contain rich information, and they are used for various stage of a construction project including design, detailing, pre-construction, construction, assembly, as-built and hand-over, facility management and analyzing energy performance. BIM is also able to share details between project stake holders such as designers/architects, facility owners, fabricators, MEP engineers, contractors and consultants. What are benefits of BIM for owners? On the other hand, 3D BIM modeling may actually be the basis for planning, designing, constructing and managing a particular construction project in some cases. In such scenarios, multidisciplinary project stakeholders are required to access the model at various stages of a project lifecycle. Therefore, the richness of ‘information’ embedded into the model decides the success of any BIM-based project. According to the scope of the project, valuable information like dimensions of building elements, material requirements, quantity take-off data, costing, time scheduling, activity simulation, prefabrication data, and energy performance are contained in a rich 3D BIM Model. 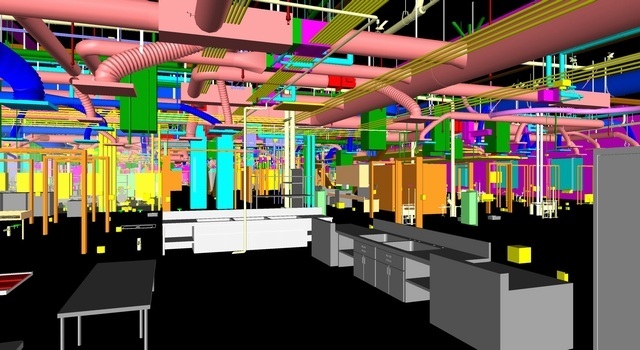 As BIM is a more progressive approach to planning, designing and coordinating models and drawings, the AEC industry are required to shift from non-BIM 2D to collaborative BIM workflows, even though the clients do not demand.